in charge of mine, or group of mines, and is responsible, on behalf of owners, for its proper working; also manages commercial side of undertaking; has statutory duties under Metalliferous Mines Regulation Acts, 1872-5, or Coal Mines Act, 1911; may also be a mining engineer. slang term used in respect of any official post; sometimes specifically designated, e.g. , mine boss, shift boss (051) q.v. 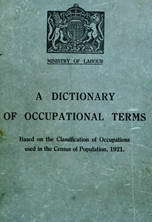 slang term for various officials, including agent, manager, under-manager q.v. is responsible for installation, maintenance, and periodical overhauls and inspection of all engines and machines in use at mine. is responsible for control, management, and direction of mine, to which he gives daily supervision; has various statutory duties under Coal Mines Act 1911, or Metalliferous Mines Regulation Acts 1872-5; is subordinate to agent q.v., where both are appointed. is in general charge of all underground operations. collects royalties due to owner of mineral-bearing land, and acts generally on the latter's behalf, making periodic inspections of mine workings. makes daily inspection of mine and is responsible for its safe working in absence of manager q.v. ; has various statutory duties under Coal Mines Act, 1911, or Metalliferous Mines Regulation Acts, 1872-5; cf. underground agent or manager (051).